In 1956 Mr. Richard Robinson, neurosurgeon at Dunedin Hospital, and Archie McIntyre, the Professor of Physiology, University of Otago, proposed the formation of a society for doctors and scientists interested in the nervous system. Derek Denny-Brown had accepted an invitation to travel from Boston to attend a meeting of the Australian and NZ Association for the Advancement of Science in Dunedin in January 1957. Robinson and McIntyre used this opportunity to invite him to join a neurological meeting while he was in Dunedin, which he accepted. Physicians, surgeons, radiologists, pathologists and scientists with an interest in the nervous system were invited to attend the meeting and to form a Neurological Association. This first meeting of the Neurological Association of New Zealand (NANZ) was held in Dunedin Hospital on Friday 1st February, 1957. The scientific meeting was followed by a business meeting and dinner at the Fernhill Club. Dr. Robert Quentin-Baxter, who had been unable to attend on account of illness, was elected the first President of the Neurological Association. The historic picture taken at that meeting is shown below. Most delegates were neurologists, unless stated. 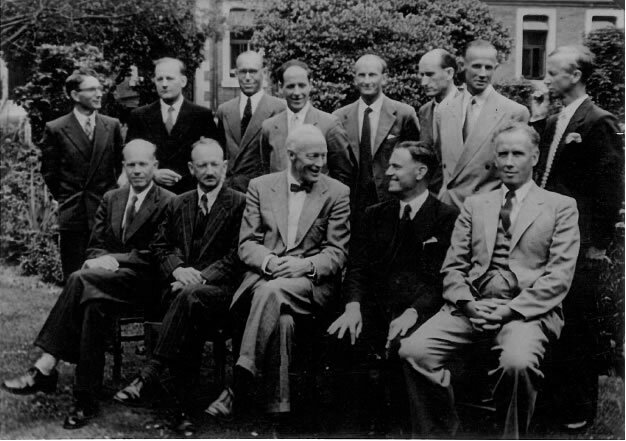 Front row (left to right): Richard Robinson (neurosurgeon), Archie McIntyre (neurophysiologist), Derek Denny-Brown (guest from Boston), Jock Caughey, Charles Begg (neuroradiologist). Back row (left to right,): William Trotter (anatomist), Keith Macleod, David Robertson (neurosurgeon), Gavin Glasgow, John Boyd-Wilson (neuroradiologist), Jake Cuningham, John Willis, Graeme Riley. Jack Bergin, Tony James (neurosurgeon) and Roland Rodda (neuropathologist) attended the meeting, but were are not in the photograph. Donald McKenzie and Robert Quentin-Baxter were unable to attend the meeting, but also became foundation members of the Neurological Association. NANZ membership is open to clinicians and scientists interested in the field of neuroscience. Membership categoriesare full, corresponding, honorary and affiliate membership. Is open to registrars in neurology or neurosurgery. The executive would like to hear from prospective members, via a primary and secondary nomination by existing members, with election at the annual general meeting.